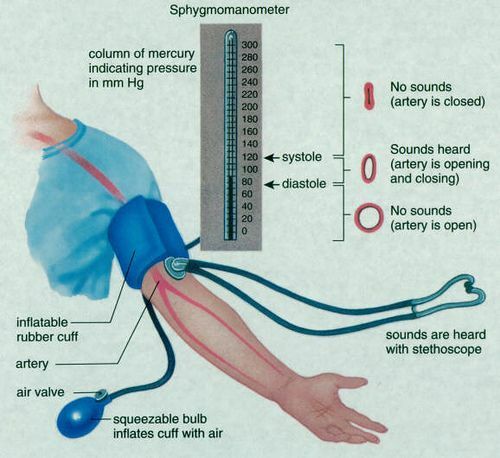 As per my understanding a sphygmomanometer when wrapped around the arm and inflated only measures the pressure of the air inside the cuff, doesn't it? How does that translate directly to the pressure value of blood flowing across the artery? The blood pressure measurement process is fairly cool, and goes like this. Inflate the cuff to well over plausible blood pressures (250mmHg or so). Slowly deflate the cuff while listening to the artery. When you start to hear sounds, that's when the systolic blood pressure is higher than the cuff pressure and the heart can squeeze a little blood through the cuff, which makes a little squirty noise. As cuff pressure continues to drop it stays between the systolic and diastolic blood pressures and therefore bloodflow stops and starts and creates audible turbulence. When the artery stops making noise, the cuff pressure is below the diastolic blood pressure and the cuff has no effect on the artery, so it goes back to laminar flow that doesn't make noise. Measuring the pressure of the cuff is just part of controlling the pressure of the cuff. You could conceivably measure blood pressure by submerging their arm in water(mercury would not require a conversion, but vats of mercury are unpopular in doctor's offices) and listening for Korotkoff sounds and measuring the depths where they start and stop. Edit: The actual question here is how does cuff pressure physically change the arterial surroundings, not how do we link the two clinically. The body is mostly water, and water is incompressible. For small strains(amount of deformation) flesh isn't that springy and mostly "flows" like water. When you pressurize the cuff around the arm, the flesh of the arm equilibrates to the cuff pressure the way balloons equilibrate to the air pressure, only less dramatically because water is mostly incompressible. For small pressures and large cuffs, therefore, the cuff pressure is the pressure on the artery wall, and by listening for Korotkoff sounds while varying the cuff pressure the blood pressure can be roughly established. The reason why you don't lose all blood flow to your extremities while diving underwater is because the systemic pressure on all of your body raises your internal blood pressure, making the net external pressure on any part of your body zero. (The cuff works by exerting a relative pressure difference on part of your body.) At high altitude the sphygmanometer is still accurate-ish because the cuff pressure relative to the atmosphere is still the same as the blood pressure, relative to the atmosphere. If you had air for blood(or any compressible fluid) your veins would collapse underwater. This is why your ears hurt while diving deeply if you don't equalize them: your ear is full of compressible air, and at depth the air attempts to shrink more than the flesh around it, pulling things out of place painfully. Not the answer you're looking for? Browse other questions tagged blood-pressure measurement or ask your own question. What could an increase in systolic blood pressure and decrease in diastolic mean?